In one of my courses, in addition to talking about preference to using the left or right sides of our brains, we dicuss learning styles. 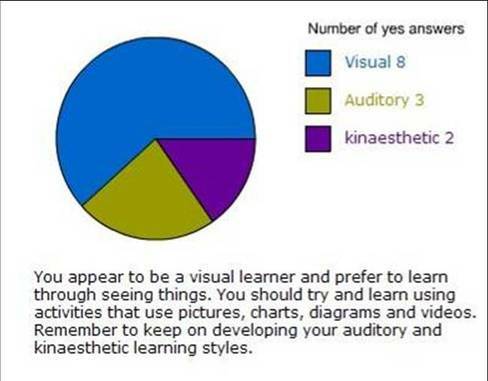 I have my students take this survey to find out what learning style they prefer. Taking the survey myself only confirms what I knew to be true. I am a very visual learner. I wanna see it in black and white--and color. Sometimes even just writing something down and throwing the paper away improves my ability to remember it. Below is my chart from taking the survey. Hey, did you change your background color? I just noticed it today, and it looks great. I also took those sorts of tests two years ago. I wasn't surprised to learn that I am a highly visual learner, but I was surprised to learn that I am also a highly kinesthetic learner. Now, I realize that is true. Let me see it, or let me touch it, but by all means don't try to tell me about it because I won't remember a word you say! I love to use my hands and my eyes--guess that makes the computer a natural for me. I am highly kinesthetic....and audiory! I can't keep my hands off things! Thank you, Amanda. I am doing grades 3-6 and like this one--especially for those visual learners--like me! my fresh flowers I bought some flowers for 10 NT (about 30 US cents) for my dinning room table. They have lasted over 2.5 weeks now. And, they are now more beautiful than when I bought them (most of them opened up at my home). My buying of fresh flowers is thanks to be flywashed by Flylady!! Oh Lord, You're Beautiful Keith Green's song "Oh Lord, Your Beautiful" is perhaps one of my all time favorite songs to worship the Lord with. I love it. In fact, for several years now, I have wanted this song (the WHOLE song) sung at my funeral. (The only reason I know this or thought about this was there was a class offered at my college where one assignment was to plan your own funeral. I didn't take this class, but I thought about the assignment. This song is the only real decision I made in regards to my own funeral.) There is more than one version of it. There is one part that is most commonly known by many people that we sing today. But, there are other versions--all sung by Keith Green--on different albums. It was like he was writing the song and editing the song as he led others in worship. Here is my favorite version: Oh Lord You're beautiful Your face is all I see For when Your eyes Are on this child Your love abounds to me Oh Lord my body's tired But You keep reminding me Of many holy, tireless men Who spilt their blood for Thee I wanna take Your word and shine it all around But first help me just To live it Lord And if I'm doing well, Help me to never make a sound * Except to give all the glory to You * Oh Lord my faith is small And I need a touch from You Your Book of Books lies on this dirt And the prayers from me too few Oh Lord please light the fire That once burned bright and clear Replace the lamp of my first love That fueled with holy fear *In another song these lines are: And when I'm doing well, Help me to never seek a crown. For my reward is giving glory to you.